As I mentioned in my last post, I have been going through some transitions lately and I am really looking forward to sharing more fall-inspired recipes here. The trouble has been that I have been so occupied with other work that my energy has been scattered. I like to pride myself about being the ultimate multi-tasker but in reality I need to focus my energy on one thing and that with the utmost concentration. Perhaps that is the reason why I have been baking more than usual. I don’t need to eat it that much but it gives me pleasure just to see happy faces at the table and to see their reaction as they try whatever I have made. That is what makes me do the work that I do. I love making people happy! Fall is a time of abundance what pumkins are concerned and the season goes by just as quickly as the other seasons, maybe with the exception of winter. I mostly never get to try out all the ideas I have for this wonderful fruit or vegetable (it seems strange to call it a fruit but it is) but once the new year rolls by I am usually craving other things and loose desire to experiment. When the first ones arrive at the beginning of the season I welcome them enthusiastically and am bursting with ideas. Perhaps my most favorite way to eat it is in soups or salads. A staple dish in my weekly rotation is a quinoa salad with roasted pumpkin/squash. Here in Austria the most commonly available variety is the red kuri squash. It looks like a mini pumpkin and the skin can be cooked as well. The second most common variety is butternut squash. Both are great and I usually alternate using one or the other. I once had Hokkaido squash from Japan and it was exquisite in taste and texture. It was deep orange with a very creamy and dense texture. The flavour was somewhere in between a chestnut and a sweet potato. In any case, it was delicious. Before the season ends I hope to explore new ways of using this most versatile fruit. Inevitably when fall arrives, I start to crave pumpkin in all forms. There is nothing quite as comforting as a cozy pumpkin soup served with toasted pumpkin seeds and a drizzle of pumpkin seed oil. Austria is blessed with pumpkin products of high quality and also boasts the highest percentage (20%) of organic farming in Europe. Besides that, Austria has a lot of traditional dishes involving pumpkins or squash in many ways. The pumpkin seed oil looks like liquid green gold and has the most wonderful nutty flavour and naturally pairs with all dishes related to pumpkins. 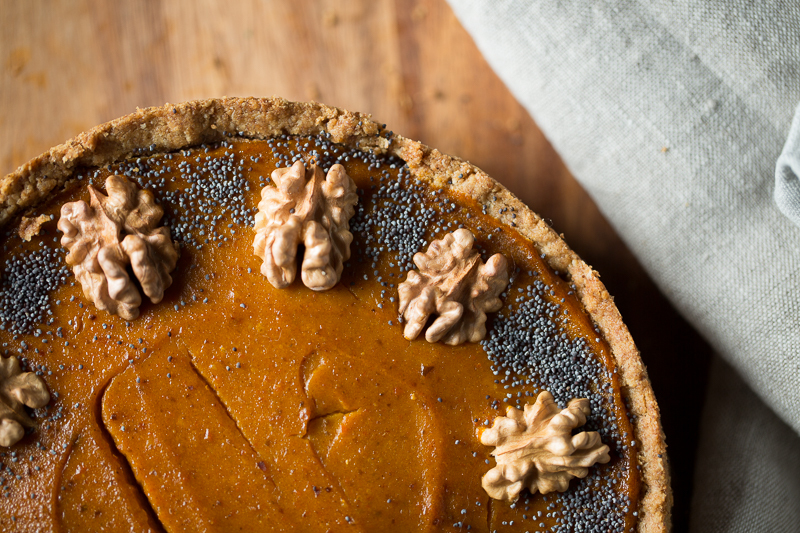 This pumpkin pie was born out of my craving for something warming and pumpkiny and I tweaked all the recipes I have used in the past to make something that suits my current mood. I like my desserts to be flavoursome but light enough that I don’t feel like I’ve eaten a meal after one slice. On the other hand, I also like it to be nutritionally dense so that I can technically eat it for breakfast as well. This pie benefits from sitting, as the flavours meld more and it sets beautifully. The addition of walnuts and poppyseeds are for flavour and decoration as well. I wanted to create something new and a little bit different. Pecans I imagine would be another smashing combination. This pie would also be a welcome guest on any Thanksgiving table and for any celebratory table. This recipe is an ode to fall and all things cozy. The warming spices and creamy filling are a welcome change at this time of the year. Each season has a way of expressing itself through food and for me the pumpkin is to fall what the tomato is to summer. Enjoy it with a nice herbal tea or with a matcha latte or however you want. Preheat the oven to 170 °C. Line a 20 cm spring form pan with parchment paper. Set aside. Cut the red kuri squash in the middle and remove the seeds with a large spoon. Drizzle a little coconut oil in each half of the squash and sprinkle with a pinch of fine sea salt. Place the squash halves on a tray lined with parchment paper facing upward and roast for 20-30 minutes until a skewer inserts easily into the centre of a piece. Leave to cool. Blend the squash with the water until really smooth, skin and all. For the crust combine all the dry ingredients in a food processor and process until the oats and walnuts are ground into a course flour (about 10 seconds). Don’t over process otherwise the walnuts will turn into nut butter. Add the remaining ingredients and add the water slowly until the dough starts to form a ball. Line the spring form pan using some plastic wrap to press the dough into the pan, starting in the middle moving up the sides. Chill the crust for 20 minutes then blind bake the crust for 15 minutes. While you blind bake the crust prepare the filling. Place 500 g of the squash puree along with the other filling ingredients and process until smooth. Taste and adjust seasoning to your liking. Maybe add a little more sweetener or spices. Once the crust has been blind baked, remove it form the oven and fill it with the filling smoothing it out with a spatula. 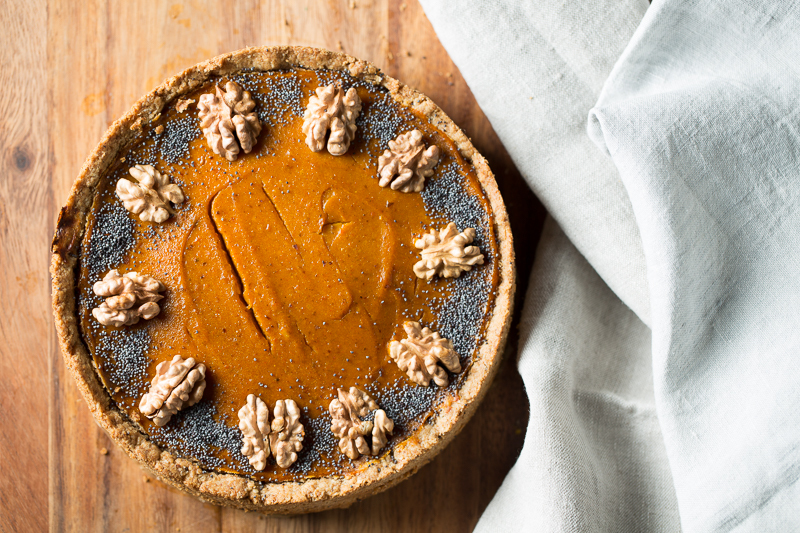 Bake it for 20 minutes then add the walnuts and poppy seeds on the edge of the pie. Reduce the oven temperature to 150 °C and bake it for an additional 10-20 minutes. The pie is ready when it has formed a slight skin on top and when it wobbles just a little. Leave it to cool completely before serving. It is best served within a few hours but can also be kept in the fridge for up to 3 days.